Whispers in the Loggia: "One Word Suffices: The Cross"
Thank you for having taken part in these moments of deep prayer. I also thank those who have accompanied us through the media, especially the sick and elderly. I do not wish to add too many words. One word should suffice this evening, that is the Cross itself. The Cross is the word through which God has responded to evil in the world. Sometimes it may seem as though God does not react to evil, as if he is silent. And yet, God has spoken, he has replied, and his answer is the Cross of Christ: a word which is love, mercy, forgiveness. It is also reveals a judgment, namely that God, in judging us, loves us. In judging us, he loves us. If I embrace his love then I am saved, if I refuse it, then I am condemned, not by him, but my own self, because God never condemns, he only loves and saves. Dear brothers and sisters, the word of the Cross is also the answer which Christians offer in the face of evil, the evil that continues to work in us and around us. Christians must respond to evil with good, taking the Cross upon themselves as Jesus did. This evening we have heard the witness given by our Lebanese brothers and sisters: they composed these beautiful prayers and meditations. We extend our heartfelt gratitude to them for this work and for the witness they offer. We were able to see this when Pope Benedict visited Lebanon: we saw the beauty and the strong bond of communion joining Christians together in that land and the friendship of our Muslim brothers and sisters and so many others. That occasion was a sign to the Middle East and to the whole world: a sign of hope. We now continue this Via Crucis in our daily lives. Let us walk together along the Way of the Cross and let us do so carrying in our hearts this word of love and forgiveness. Let us go forward waiting for the Resurrection of Jesus, who loves us so much, who is all love. 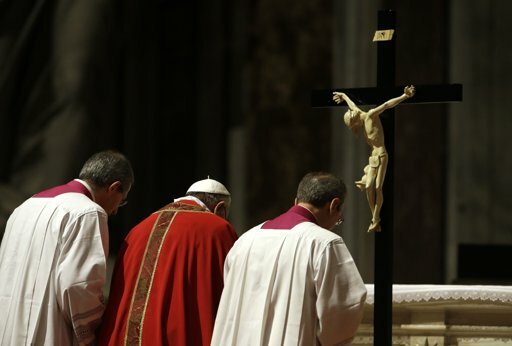 The preceding is an English translation of Pope Francis' remarks at the conclusion of tonight's traditional Good Friday Way of the Cross at Rome's Colosseum.